Now we'll know what Pokémon tastes like. Starbucks (SBUX) announced on Wednesday it is introducing a Pokémon Go Frappuccino, a frozen raspberry and blackberry-flavored take on its Vanilla Bean Frappuccino. 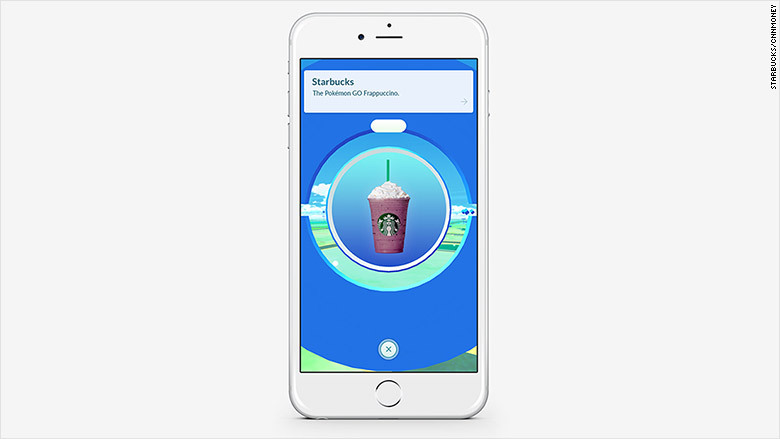 The drink, which will be available for a limited time, will be featured only at store locations listed as PokéStops and Gyms -- physical areas that let Pokémon Go players catch the characters or battle other players. About 7,800 of its U.S. locations will carry the Pokémon Go Frappuccino. Starbuck's move intends to lure users into stores after arriving to play the game. The augmented reality app became a phenomenon this summer. It broke Apple App Store records and prompted millions of users to run around outside to catch virtual Pokémon in real-life locations. As a result, hard-core users on average took 26% more steps on days playing the game. Many businesses benefited by the craze and experienced an uptick in sales, including Doughnut Plant in New York City. To further capitalize on the trend, the bakery advertised itself as a Pokémon Gym. While the game's popularity has since declined, Pokémon Go remains among the top 30 gaming apps in iOS and Android app stores, according to App Annie.